I am pleased to announce that I am represented in Gainesville, Fl. by Thornebrook Gallery in Millhopper Square. A collection of my newest paintings was recently installed, offering a selection of sizes and scenes giving people the opportunity to add just the right painting to their personal collection or to give as gifts. 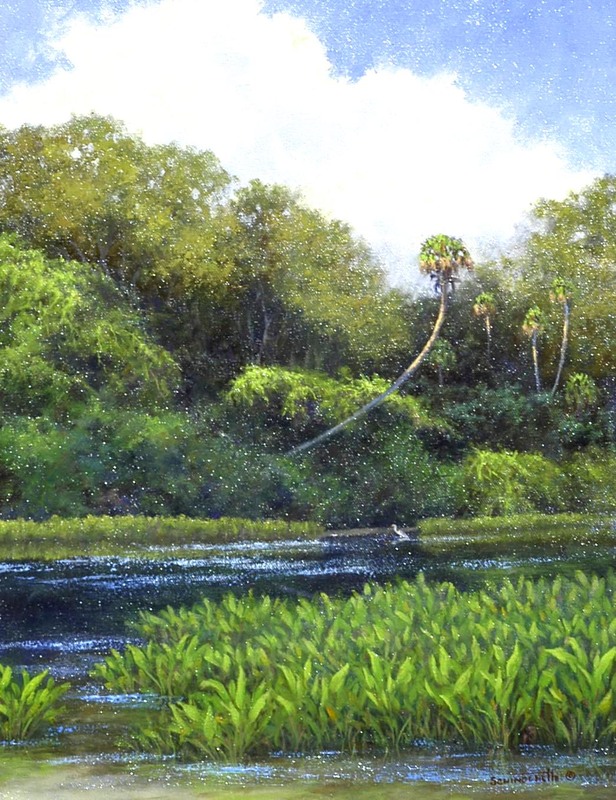 "Summer's Dream" 18"x14" (Right)Painting at the edge of any of north Florida's natural springs is shear pleasure. The water is a contant 72 degrees year round. These are just two of my paintings now available at Thornebrook Gallery. Please stop by, say HI to David the owner, enjoy the art and take a treasure home. White Ibis 2" x 3"
I finally have time to create and post miniature paintings for my weekly auction. 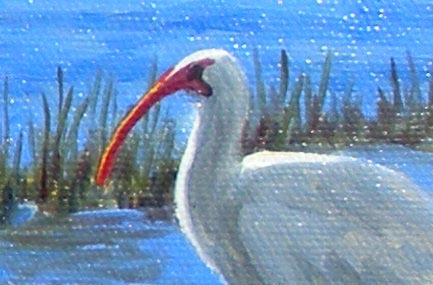 This White Ibis was inspired by the many birds I saw while painting in the Wekiva Springs Plein Air Event last March. They particularly enjoy wadding in the reeds that grow in the shallow water near the bank of Lake Prevatt. Bids start at just 99 Cents. Well I made it through my busiest time of the year. All the plein air events are over, the fine art festivals are put to bed, my last gallery show closes May 29, and my current commissioned painting is on the easel waiting for the finishing touches. 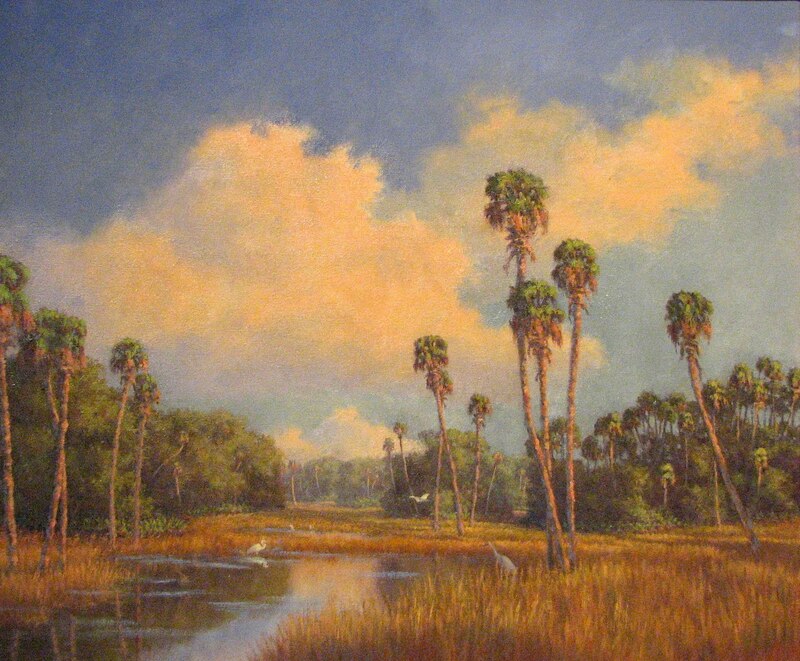 It has been a great season topped off with the opening of my gallery in Ocala. VoilART! Gallery has turned out to be better than I could have hoped for. 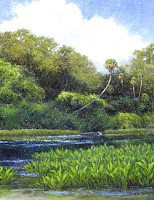 Collectors who have purchased my work over the years are happy to be able to see my paintings anytime...not just once a year at an art festival or plein air event. 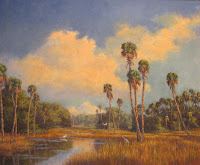 Ocala locals are discovering the gallery and are pleasently surprised to learn there are professional artists right here in their own backyard. My gallery partner Sharon Crute and I are thrilled with the city's reception and support of our First Friday Art Walk, the great attendance at our monthly Coffee And Conversation and the everyday adventure of meeting new people visiting the gallery. 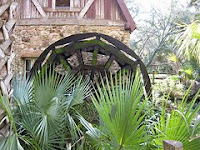 Ice House Gallery is in the heart of MacIntosh, a wonderful little village-like town just north of Ocala, Florida on US 441. Owner George Ferreira is always coming up with interesting theme ideas for exhibits, the latest being "Art and Apparatus" now open through May 29. This eclectic show offers something for everyone from a hand made wooden merry-go-round crafted by Trish Beckam to a bomb-laden vest by Gary Borse. These are a couple of the extreme art works in the collection of super paintings whose creators include Peggy Watts, Nancy Moskovitz, and Annie Paise to name a few. I am happy to be included in this group. The artists were directed to include man made objects in our works for this themed exhibit. Since I find trees and nature most interesting to paint I had quite a challenge to come up with something. Luckily I remembered visits to Juniper Springs State Park in the Ocala National Forest and the wonderful old Grist Mill and Paddle Wheel at the spring head. The painting turned out well, considering I am a landscape painter who does not paint buildings and structures very often. I also painted an old wooden hoist my mom had hanging in her garage for many years and now hangs in mine. It was fun to paint partly because it brought back memories of her and the many things she collected. But, I did not tell George about the funniest thing that happened to this painting. I layed it on the trunk of my car while loading things to go to my gallery. Yes, I forgot it and took off. A couple of blocks down the street I realized what I had done and back I went. After a couple of trips up and down the road I found it in the middle of the street. It had been run over a couple of times but surprisingly no major damage. I framed it and delivered it to the Ice House. No one knew!! So, don't you tell!!! The third painting was inspired by the gorgeous azaleas in my yard. I could not resist painting a clump of beautiful flowers with gardening tools resting on the ground in front of the bush. I do hope you can get by to see this very intersting show before it closes May 29. If not, I will post my paintings here soon.